With Russia’s main protest movement enfeebled and Vladimir Putin’s leadership apparently secure, opposition to the regime is growing more radical. In this article, Emma Rimpiläinen assesses the origins of Russian nationalism and their potency in today’s Russia. 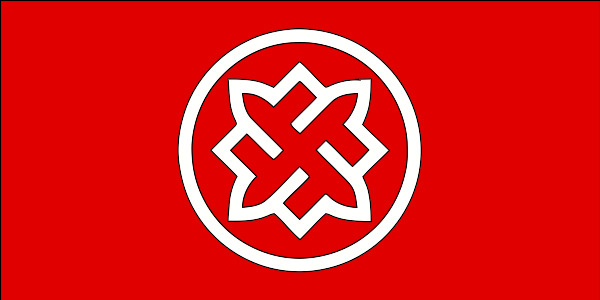 Flag of the far-right Russian National Unity party, slogan: “Russian for Russians”. Many observers of Russian politics are familiar with the trend of intensifying Russian nationalism, embodied in President Putin’s imperialistic vision of a Great Russia. However, fewer seem as familiar with the idea, promoted by some in the nationalistic opposition, that the main problem in Russia today is that ethnic Russians are the country’s oppressed majority, even though it has been discussed by such figures as writer Dmitriy Galkovskiy, nationalist politicians Konstantin Krylov and Dmitriy Dyomushkin, and journalist Egor Prosvirnin. Since nationalist movements seem at the moment the only viable opposition in Russia, this idea and its consequences for Russian politics should be seriously studied. This line of argumentation, sometimes ironically referred to as the RLO discourse (РЛО, short for “Русских людей обижают”, Russians are discriminated), propounds that the oppression of ethnic Russians is the single largest problem for democracy in the Russian Federation: citizens’ faith in democracy is non-existent, it suggests, because they are treated as strangers in their own country. Different groups, ranging from Jews to the North Caucasians, are often supposed to hold power over the country (see, for example, Egor Prosvirnin). According to nationalists, the current political system is built on the ruins of the Soviet nomenklatura; with power derived or passed down by parents to their children from positions held in the Soviet Union. The political elite, which in many ways coincides with the economic elite, is only interested in securing the benefits it has achieved and not representing the people’s interest. It is implied, but not often stated explicitly, that the current situation benefits the ethnic minorities living in the Russian Federation at the expense of ethnic Russians, since ethnic minorities are said to be overrepresented in the ranks of this aristocracy and on all levels of administration. The current regime lacks popular legitimization because the ethnically Russian majority is not appropriately represented. For an outside oberver, the idea of Russians being oppressed in Russia sounds, if not outright absurd, quite paranoid. However, its proponents do raise some valid concerns about the state of democracy in Russia, or more precisely the absence thereof. Even if the allegation of unbalanced ethnic representation is ignored, the lack of grass-roots democracy and effective federalization, and the (un)sustainability of the power vertical are burning questions for Russia. Observations to support the nationalists’ position are typically the following: Russians do not have their own designated republics, as is the case with Udmurts who have their Udmurt republic, Chechens who live in Chechnya, and Tatars who inhabit Tatarstan, for example (See Window on Eurasia, which references a nationalist that has adopted the username Sinn Fein, after the political wing of the Irish nationalist paramilitary); ethnic republics even possess characteristics resembling state sovereignty (especially true for Chechnya, which has its own justice system, president and de facto militia); Russians live in republics named after other ethnicities or in less autonomous non-ethnically designated areas (oblasts or krais) but often constitute the majority of the ethnic republics’ population. Additionally, it is argued that Russians cannot claim their rights as a group because they are not allowed to found organizations that would advocate the rights of Russians or develop national culture. Russian nationalist parties and their leaders are being continually harassed by Kremlin; see for example, the struggles Krylov’s National Democratic party has faced when trying to register as an official party. The nationalists claim that organizations like these get labelled as chauvinist and banned immediately (Konstantin Krylov talks about the censure of Russian nationalism). At the same time, Russia’s ethnic minorities are able and even encouraged to found and develop their national organizations. Many of the facts presented above are certainly problematic. The Russian ethnos or nation has indeed never experienced statehood, and this no doubt has profound effects on Russians’ identity. Raisa Barash, junior researcher at the Moscow Institute of Sociology, notes that Russians have never had the chance to realize their right to their own ethno-subjectiveness. According to her, in Soviet Union the term “Russian” became synonymous with the word “Soviet”, and later in Russian Federation with ”rossiiskiy” (Russian not in an ethnic sense, but rather a “civic Russian”). An ethnic Russian identity has been suppressed. The “Russian Spring” in Crimea sparked a sense of political subjectivity amongst ethnic Russians for the first time in a long while. Indeed, Barash speculates that the high approval ratings for the Crimean campaign among Russians reflected the unresolved problems of their ethnosubjectivity. Previous post ← Sino-Russian relations: where’s the catch?